--------------------------------------------------------- ##BRAZIL, STOP THE EXPORT OF LIVE ANIMALS TO OVERSEAS COUNTRIES NOW!!! Live cargo shipments (usually very young, with a few years of age) represent true torment for animals. They go through numerous problems as they are removed from their natural environment until they reach their destination. The first one is boarding in trucks. The animals are kicked, bruised and driven by sticks. Then comes the displacement to the quarantine, which can reach many kilometres (in the last one it had in Brazil, in Jan / 2018 on the ship Nothing, the oxen left in the south of the country and were taken to farms in the interior of São Paulo, travelling more of 900 km). This means hours and hours of the route known as "standing ox" - the animals are pressed against each other in the truck so that they can not lie down - under sun and rain, with animals treading and sniffing their own faeces (which are fermenting). As recommended by the Ministry of Agriculture, Livestock and Supply, the "Manual of Good Management Practices for Transport" recommends that the animals be landed and have the right to rest, food and water at will only on trips lasting more than 12 hours. hours are reached so that the animals receive the food and water they need full time. If the route that the truck travels normally is arduous for the people involved, because of the problems like the lack of road conditions and the structure of the truck itself, imagine how aggressive it is for these animals. In addition, drivers often climb on trucks to check the load, which causes more stress to the animal. This is because animals have to always stand, otherwise they can trample on what is lying down and cause injury or even death. Therefore, once again the stick is usually used. After the quarantine, they begin another voyage of many kilometres again, under the same unhealthy conditions, of suffering and restraints, to finally arrive at the port where they will be embarked. For this, the carts are positioned so as to corner the animals in a corridor that directs them to the boarding platform. Desperate, often even hurting themselves, they travel the only possible path that leads them to the ship and then to death. But all this was only part of the long martyrdom that these animals spend. Frightened by the situation, many of them refuse to walk and then carry shocks of electric or pointed rods to enter the ship. And inside, more suffering. With two or three animals packaged in small bays, they are squeezed in places that are often not even airy, as is the case of many floors below the hull of ships. If the vessel stays on the dock for a longer time than expected, as was the case of the ship Nothing in early 2018, residents of Santos, port of embarkation, even complained about the bad smell coming from the ship and spread through the ship. City. One imagines, then, the degree of unhealthiness in which these oxen were living at that moment. cause of the sea and be falling in the middle of faeces, urine and vomiting. These unhealthy conditions cause pneumonia (embarrassment fever), Salmonellosis and Moraxella bovis (red eyes), according to an investigation by the NGO International Animals. Apart from all this, many suffer fractures and are no longer able to stand or feed. It is natural, during this course of hell, that 8-10% of animals die cruelly or painfully before reaching their destination. What do they do with bodies? Put it in a freezer or throw it in the sea? And those who get sick or hurt? Are there any veterinarians on board to treat them? Are they sacrificed? Are they thrown alive into the sea (as we have seen in the picture)? Now, if everything was done within the hygiene, safety and health standards envisaged by public agencies, why is so much hidden? The truth is that there is no way of knowing, much less supervising the treatment given to animals after boarding, and especially on the high seas. The only way to avoid all this distressing trajectory to death in a foreign country is to stop the shipment of live animals. And what will happen to these animals when they reach their destination? This is not explained to us! But we know that many foreign countries, especially those in the Middle East, have traditionally subjected the animal to a cruel death, full of torture and pain, in order to obey the dictates of their religious rituals. And is all this necessary? NO!!! The displacement of animals over long distances is cruel and totally unnecessary. By land or sea, suffering caused by traumas,, lack of food and water, exhaustion and lack of hygienic-sanitary conditions. In addition, ships cause a serious environmental impact during the entire voyage, as they discharge dead sea animals and carcasses in the sea. The last shipment of live cargo on the ship Nada, moored at the Port of Santos in early 2018, exposed the suffering of these animals to the whole society through videos and photos disseminated intensely by social networks. It is of fundamental importance that the entire Brazilian community and also the world community sign this petition. We have to show the public authorities that we are against submitting these animals, which already die young to give a few minutes of pleasure to the palate of some people, to so much unnecessary suffering. That Brazil has a law that definitively prohibits the shipment of live cargo on ships. 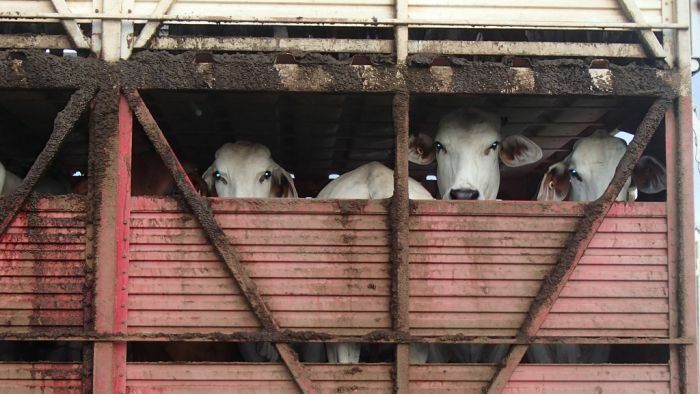 The portal Dağ Medya, an independent site of news on economics, politics, science and the environment, has published an extensive editorial entitled "Ships of Death", which exposes the scenario behind the export of live cattle in Brazil. Most of that market goes to Turkey, a Muslim-majority country, importing animals for halal slaughter, where animals are slaughtered upside down. Federal Deputy Beto Mansur (PRB-SP) heads the list, identified as a "congressman, cattle rancher and accused of slave labour on his farms." Blairo Maggi, currently Minister of Agriculture, Livestock and Supply, is remembered as "the second richest politician in Brazil", a farmer and cattle rancher. It is also remembered for the "Gold Chainsaw Award", awarded to Maggi in 2005 by the environmentalist Greenpeace, "for its contribution to the destruction of the Amazon." Not even the president Michel Temer was spared by the publication, having its name associated with "corruption scandals that shook the country", citing even fraud schemes involving the port of Santos, from where the ship NADA left carrying about 25 thousand live cattle. About the company, Minerva Foods, responsible for the sale of 25 thousand animals and one of the largest in the world, the author informs the application of more than 1 million dollars in fines for mistreatment and other environmental infractions involved in recent events. The author mentions allegations of bribery of public officials. 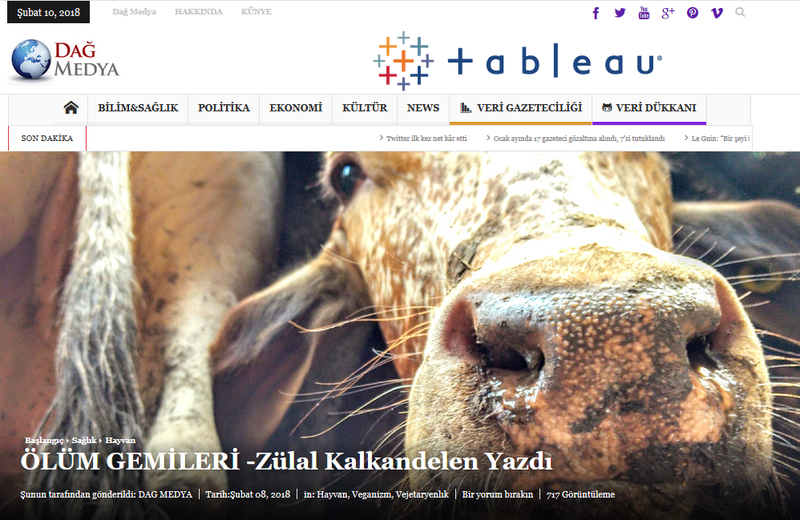 Turkey's government, for its part, would be boosting trade in live animals with the "cheap meat" policy. Mehmet Yildiz, administrator of the company Yildiz Shipping, responsible for the contract with Minerva Foods and numerous commercial agreements involving the import and export of live animals. The publication describes the action of the Brazilian activists, who put themselves ahead of the carts that took the animals to the port of Santos, in addition to the legal actions proposed by animal protection entities. From these processes, technical inspections were carried out that showed the poor conditions in which the animals are transported in the wagons and ships. As a result, not only was the ship NOTHING required to land some 25,000 animals, but it also resulted in a ban on the shipment of live animals to all ports in Brazil. The text also tells the sad ending, when, according to the author, "in one day" judicial decisions were overturned with a "political manoeuvre" when the Brazilian authorities are again nominated. The story, which has several videos and photos of the animals being transported in the midst of many faeces, concludes with a strong criticism of this type of trade and invites the reader to reflect: "I want to be a person who supports this terrible cruelty in ships of death? ".